So you may have heard of Hatreon, a Patreon alternative that accepts people whose views are too radical or against the TOS for Patreon, Newsweek has done a piece on it along with some other media outlets. What you may not have heard about is the founder and his radical views. Hatreon has attracted the likes of Andrew Anglin(creator of The Daily Stormer), Richard Spencer(white supremacist and nationalist), James Allsup, and Andrew Aurenheimer(black hat hacker, white supremacist and white nationalist closely associated w/ The Daily Stormer). The man who started Hatreon is Cody R. Wilson, a radical libertarian who is so opposed to gun control that he created a 3D printable pistol for distribution to the general population and in 2012 was featured in The 15 Most Dangerous People in the World. He also has a site where you can buy the equipment to produce unserialized M-16 lowers. Mr. Wilson also believes that gun control laws are the tyrrany of the majority and something to be “solved”. So an anti government, anti gun control libertarian has set up a funding site that far right wing radicals have flocked to in order to fund their hatred and propaganda. His anti gun control stances are particularly scary in this situation. I’m sure you have all seen white supremacists show up to rallied in body armor and strapped with weapons right? Imagine if they show up with 3D-printed pistols that are untraceable and undetectable by standard security systems? They are only good for a few shots but the potential is scary. Hatreon is, by its very name and stated purpose, enabling hatred. I think it is only a matter of time before they actively facilitate domestic terrorism. As more and more radicals flock to the site, it is inevitable, especially given the owners’ views on gun control. 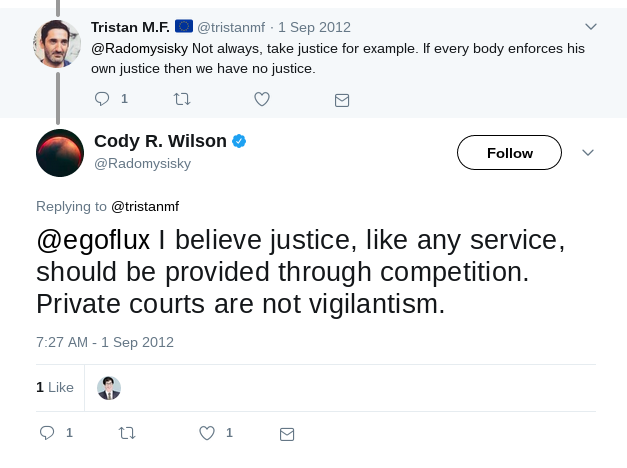 Now think about the above scenarios then keep in mind that Cody Wilson has also worked to make Bitcoin more anonymous via a service called Dark Wallet. This is the service Wired said would make Bitcoin laundering much easier, but more to the point of this article would make Hatreon donations untraceable, when the inevitable domestic terrorist sprouts from Hatreon they will go back to look for who funded them. When that happens there won’t be a way to determine who at least some of the funders are. Untraceable funds to radicals, facilitiated by Hatreon which is run by someone who is anti government, anti gun control, someone who actively supplies people with way to manufacture their own undetectable and/or untraceable weapons, anyone else connecting the dots here?